Mid-to-large size conference rooms and higher-ed classrooms that need an ultra short throw (UST) and 4K UHD resolution (3840x2160). 2-year Advanced Exchange warranty for the projector; extended warranty available for up to 5 years. Proprietary app adds network support for mobile devices connected to the network through an access point. Physical attributes. The ports, power connector, Kensington lock slot, and intake vents are on the front panel, meaning the side facing the screen. The security bar is on the bottom of the projector, near the front panel, close to the right side as seen from the front. The exhaust vents are on the left and right panels. The two 6-watt stereo speakers are on the back, facing towards the viewing area. The window that serves as a lens is on top, in a recessed area near the back panel. Low Lamp Mode. Eco mode is roughly 81% as bright as Normal mode. Presentation Optimized Lumens. Bright color mode with its default settings delivers vibrant color for documents and graphic images along with realistic color for many photos. That makes it the Presentation Optimized mode for most purposes. Even Eco mode's 4032 lumens delivers more than enough brightness to stand up to moderate ambient light at the maximum 130" diagonal image size. Video Optimized Lumens. For best color accuracy for video and film, Presentation mode with adjustments is bright enough in Normal power mode--at 2679 lumens--for a 130" diagonal image in moderate ambient light. Brightness Uniformity. The S718QL's measured 72% brightness uniformity is typical for UST projectors. The variation in brightness across the screen is enough to see on a solid white image as a broad center swath that's brighter than both the left and right sides. However, it drops off gradually enough that it is hard to see with any text, graphics, or photo that breaks up the field of view. Input Lag. The input lag is 97 ms in all predefined color modes. Throw distance. Measured from the front of the projector, throw distance ranges from just under 4 inches for the minimum 100" diagonal image to just under 9 inches for the maximum 130" image. Image sizes smaller or larger than the supported range are possible, but can have problems with geometry and focus. The 0.19 throw ratio is based on the location of the lensing system window, which is roughly 12.5" farther from the screen than the front. The Projection Calculator will give you the throw-distance for the image size you want, based on the distance from the window. Mounting. The simplest way to set up the S718QL is on a table in front of and just below the screen. However, you can also put it in wall mount above the screen, on its left or right side in portrait orientation on a table or in a mount, or facing straight up to project an image on a ceiling. This translates to significant flexibility for setting up displays and signs. With the projector sitting on a table, the bottom of the image is roughly 18% of the image height above the lensing system window. Special UST considerations. As with any ultra short throw projector, the S718QL is best paired with a high quality screen that's tensioned or otherwise engineered to be as flat as possible to avoid obvious distortion in the image. Ambient light rejection (ALR) screens also have to be designed for UST projectors, since the light from the projector is hitting the screen at an angle that standard ALR screens are designed to avoid reflecting to viewers. 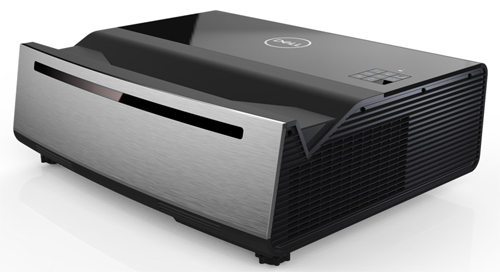 The Dell S718QL is the only current 4K projector with both 3840x2160 resolution and an ultra short throw, making it a truly unique choice at this writing and a solid value at a retail of $5,999. The S718QL is meant primarily for extreme high resolution business presentations and is designed to look good sitting on a credenza in a conference room. Adding a wall-mounted screen just above it and only four to nine inches away will give you a finely detailed 100" to 130" diagonal image. The ultra short throw lets you stand close to the screen without casting shadows, and the 5,000 ANSI lumen brightness lets it stand up to a high level of ambient light. The Dell S718QL delivers vibrant color for graphics at full brightness and acceptably accurate, nicely saturated color for video and film at a somewhat lower brightness. We saw no rainbow artifacts when viewing graphics or text documents. We noticed the occasional flashes of rainbow artifacts with video/film material, though they're infrequent enough that even those who are bothered by them shouldn't find them annoying in video presentation use. Dell points out that the S718QL's HDR mode is really HDR compatible rather than true HDR. Dark scenes with HDR input are so dark overall that shadow detail tends to get lost even when viewing in a dark room. However, this is primarily a limitation of projector technology in general rather than a problem with the S718QL. Very much on the plus side, the sealed optical system offers a 20,000-hour lifetime and 24/7, maintenance-free operation. That's a welcome convenience in a conference room or classroom. It also makes the S718QL a strong candidate for heavy duty use in venues ranging from sports bars to signs and displays in retail locations and museums. Also helping for many applications is the flexibility for mounting in portrait orientation or facing up at a ceiling and --for almost any application--the motorized focus that lets you stand far enough away from the image to see the entire screen at once as you adjust focus and keystone. This makes setup far easier than with most UST models, which force you to focus manually while only a foot or so from the screen. With its impressive constellation of features--ultra short throw, 3840x2160 resolution, 5,000 ANSI lumens, vibrant color, 24/7 maintenance-free operation, a 20,000-hour rated life for the laser, and more--the Dell Advanced 4K Laser S718QL easily earns our Road Test Certified award. Along with being a unique, and solid, value, it is a strong candidate for any conference room, classroom, sports bar, or display or signage application that needs an ultra short throw and 4K resolution. If I only have a space for 92”, can this projector be set to fit 92”? Pete, no the minimum is 100" due to lens restrictions. would this be also suitable as a home projector for watching movies? Marek, absolutely. This is a gorgeous video projector. You might want to pair it with a good UST ambient light rejection screen. The input lag is was concerns me about this projector. Has it been tried for gaming purposes by any chance? MisterB: We don't do any subjective evaluation of lag, just the metered measurement we reported here of 97 ms. That's enough so you might want to look elsewhere rather than risk buying the projector and having to live with a noticeable lag. However, it might not actually be a problem for you. Although a lot of gamers would consider a 97 ms lag unacceptable out of hand, I've seen some claim that you shouldn't notice any lag with displays that are less than 100 ms. Others put the limit for noticing a display lag at 50 ms or 30 ms or 16 ms. Clearly these are all subjective opinions. I strongly suspect they are based somewhat on reaction time, and that a world-class boxer, tennis player, or gamer will notice a lag that most people wouldn't be aware of. Complicating the issue is that what really matters is the total lag in your system, not just the display. So if you have a controller with a shorter than typical lag, you can get away with a display that has a longer than typical lag, and vice versa. Also some games are more dependant on reaction time than others, which means lag is more of an issue for those games. The best choice is to get some hands-on time with a variety of displays with different input lags, if you have the opportunity, and get a feel for yourself for how much lag is too much. 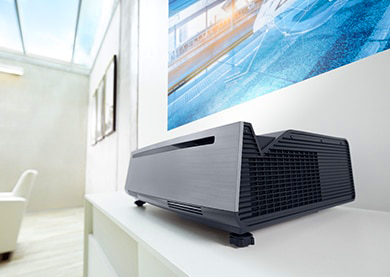 Tom: Fan noise is typical for this class of projector, which means it's a little more than you would expect from one designed specifically for home theater use, but not enough to bother most people in a conference room or family room setting that tends to have ambient noise. The spec is 33 dB in Normal mode and a much quieter 29 dB in Eco. We don't test with a PlayStation. The best way to confirm compatibility for HDR with it--or with any other HDR hardware--is to ask a Dell reseller for the lastest compatibility information. I have a very large wall I’d like to project on - 260” or so. Image quality (brightness, uniformity, sharpness) are not critical for my application. Does anyone know whether the maximum size of this projector is 130” or if I place it back further it will cast a much larger image (like a standard throw projector does). I don’t know if the lens capabilities and or automatic calibration tech of a UST projector can accommodate this type of application. Vance, most UST projectors have a minimum and maximum image size due to optical focus limitations of the lenses. You cannot exceed the max limit size and remain in focus. Thanks for your hard work. Could you share your Presentation mode adjustments for obtaining the "best color accuracy for video and film"? ...and even better, a best compromise adjustment balancing color accuracy along with ~4000 lumen output? Much appreciated. Beautiful Projector. I use it as a backdrop for our church. We shoot video with the preacher in front with stage lighting and the image looks good. I have the projector set at about 10 inches, to fill our screen and no image distortions. I currently own this projector and the lag IS noticeable. It happens to be a big issue for what I'm using it for. I own a Post Production facility and we use the S718QL as a second monitor to play movies through as we develop the sound. Unfortunately the projector DOES cause a considerable delay so the sound always comes before the picture. I use the projector as a second monitor so when you move the mouse you have to wait for the curser to move. I have been in direct connection with Dells support team to resolve the issue. I've been through 3 of their projectors to try and resolve the issue but they all have the same issue. Possibly a Gaming Mode which would reduce that lag down a bit due to its processing but no update has been created yet. It's a shame because I really love the projector. I really hope that Dell takes a hint and works on an update. I cannot get the Dell S718QL to run my Xbox One X. It will work at 1080. It says projector will not run at 60Hz 4K for xbox 1x. Its a pain to set up on ceiling (7.5FT wall in house, 10ft screen), there is no up down adjust for picture so picture winds up showing low toward floor. Had to almost adjust projector at 45 degrees and 4ft out to get picture in middle of screen. Then could not adjust keystone without making it a smaller picture of 1/2 the size. My biggest gripe is not getting xbox one x to work at 4k. Tried several 4k cables just in case. Dell support no help. Support kept saying it must be PC. I'm not using PC. Hi, can you tell us how much power this device consumes,and can you compare this with other projectors with LED light sources and the normal bulbs and OLED LG TVs. Our ProjectorCentral database lists Max Power for this projecgtor at 500 watts, and will show Max Power consumption for other projectors as well for you to compare. I'm sure the specs for LG's OLED panel televisions are available on their website. Hi, I see that there is a "USB Type A (for optional Wi-Fi dongle or reading files from USB memory key)". Does this include video files? I'm hoping I can play video files from a flash drive and simply set the video to loop ...forever. Will this work? Is there another solution other than connecting to a computer? I need several of these to be looping different videos for long periods of time. Thanks. Kris, I'd suggest seeing if you can glean anything from the user manual on this. If the projector will read files from a USB stick drive this implies a built-in USB media player, but you'd have to investigate further to find out if there is any sort of loop function. Another option would be to set up a 4K Blu-ray player that has a USB input (many do) and use the media player in that component to loop the video, which will feed to each projector via HDMI. That would be costly if you were doing different videos on each, but an HDMI splitter would allow cost effective display of the same content on multiple projectors simultaneously. You can often find PDF links to the user manual and spec sheet for any projector we've reviewed on the projector's page in our database.